All transactions are safe and secure with a reliable history in online purchasing behind each of our associates. 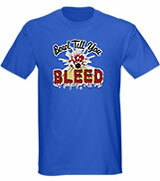 Buy the Bowl Till You Bleed t-shirt to own Dexter clothing and merchandise. There is no better way to appear normal than to be on a bowling team, at least that's what Dexter Morgan thinks. This Dexter t-shirt features the logo and saying "Bowl Till You Bleed" from the back of the police team's bowling jerseys. We chose to show it here in blue, which is similar to the real Dexter bowling shirts featured on the TV show. However, this clothing item is available in a variety of other colors that may interest you. In addition to the Bowl Till You Bleed tee above, browse the Dexter Clothing Gallery for more apparel like men's and women's clothes, kids shirts or hoodies.